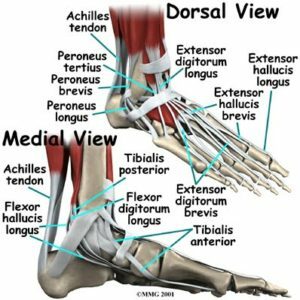 While many people know that working out their arms and legs at the gym or during outdoor exercise will have a multitude of benefits for their overall health, foot muscle strengthening is often overlooked as an viable option to help build strength and improve balance and performance. There are 20 main muscles in your feet all with different actions and jobs that help you walk, run, jump and stand. In our daily lives these muscles can become weakened, tightened and inflamed just from our normal activities. Disruption of the muscles normal strength and elasticity can not only lead to pain and dysfunction but also affect gait or walking adaptations and create joint pain in the foot, ankle, knees and hips, as well as overall mobility issues, affecting your quality of life. These muscle strengthening issues can also be exaggerated by conditions such as bunions, claw toes, repetitive ankle sprains and flat feet. An example of foot muscle strengthening exercise is picking up a pencil or marbles with your toes. This can have a big impact on building the intrinsic muscles in your feet. By completing simple exercises like this you can develop strength, which will help reduce aching and sore feet, improve balance and performance for physical activities and minimise excess forces that travel from your feet up to your ankles, knees and hips.